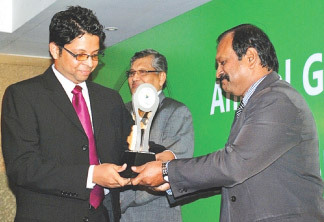 Textured Jersey PLC, has made history by receiving the award for the best ‘Green Report’ in the country at the inaugural awards of the National Green Reporting System of Sri Lanka. B M U D Basnayake. More than 60 entries from various industries were evaluated for these awards, presented by the Ministry of Environment. The reporting period was 2011. The National Green Reporting System comprises of 50 indicators including 24 environment indicators, 20 social indicators and six economic indicators, on which companies focusing on sustainability are required to report. The reporting system provides five tiers under which industries, companies or entities may report. Textured Jersey reported under Tier 02 which won the only award presented for the best Green Report in the country. Commenting on the company’s success in winning the inaugural award, K.C. Mau, Executive Director of Textured Jersey said: “Sustainability has become one of the principal platforms on which Textured Jersey is building its business and intends to compete. In an industry such as ours, a sustainability-driven approach makes good business sense. This National Green Reporting System is intended to facilitate, recognise and reward manufacturing and service sector organizations for sustainability performance. Textured Jersey employs one of Sri Lanka's most sophisticated production facilities for the manufacture of knitted fabrics for the intimate apparel and sportswear industries. A specialist in the manufacture of high quality, weft-knitted and dyed stretch fabrics, Textured Jersey is a supplier for top-notch international brands of the calibre of Victoria's Secret, Marks & Spencer and Intimissimi. The two major shareholders of the company are Brandix, Sri Lanka’s single largest apparel exporter and Pacific Textiles, a Hong Kong based company with one of the largest manufacturing facilities in China.